Instant Pot Cheesy Scalloped Potatoes are flavorful and tender. A great side dish to cook in your electric pressure cooker, especially when you need your oven for other dishes during the Holidays! Many years ago I saw Aretha Franklin, The Queen of Soul, make her famous “Queen of Soul Ham” on Martha Stewart’s show. Martha made the scalloped potatoes. She used thyme in her recipe, which I had never tried. 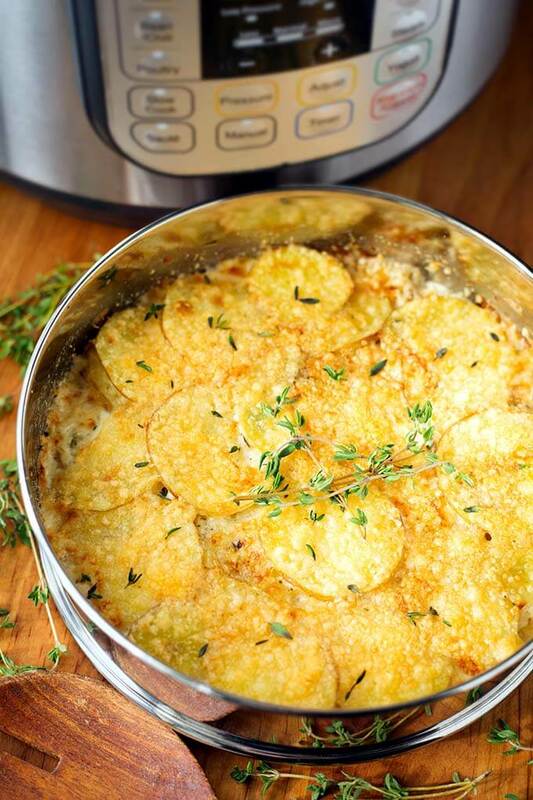 So I tried it, and I’ve made scalloped potatoes with thyme ever since! It’s a good thing (so says Martha!). I know that straight up scalloped potatoes does not have cheese in it, but we like cheese. So, This became Instant Pot Cheesy Scalloped Potatoes. Why not Au Gratin? 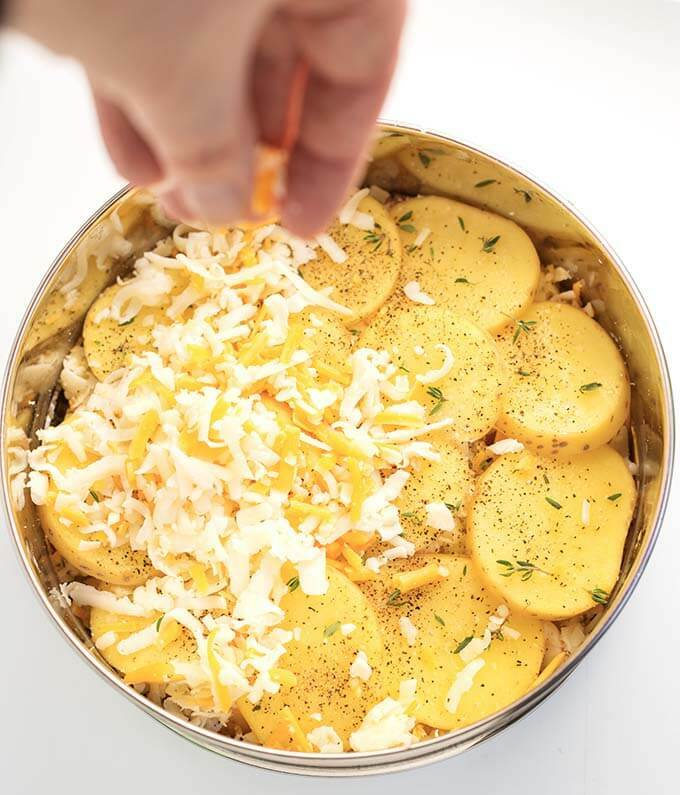 Because I think more people can relate to, and will search for scalloped potatoes (also, if you leave out the cheese and add a little more half and half, you are back to straight up scalloped potatoes). Layer the potatoes and put some seasoning on each layer. When I was developing this recipe, I kept thinking, “How can I get it to cook faster than in the oven?” Most of us want our Instant Pot recipes to cook fast. Hence, “Instant.” I hate to spoil the IP party, but these aren’t that much faster than the oven. I tried slicing the potatoes really thin, but they didn’t cook that much faster and I missed that slightly thicker bite of potato. There are 4 layers of potato, and with pressure cookers thickness often determines cook time, so it’s not going to be a fast cooking dish. But don’t despair… I found the silver lining to this scenario: I like to make Scalloped Potatoes on Thanksgiving. I can’t tell you how nice it is to have them cooking in the Instant Pot while other dishes are cooking in my oven (In my dreams I have two ovens, but alas, that dream hasn’t come true yet). So who cares if they aren’t THAT much faster than the oven?! 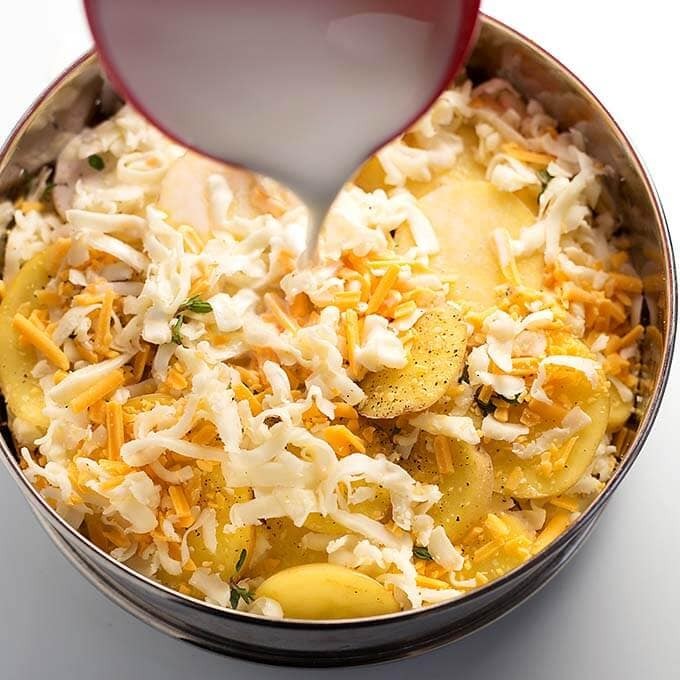 Cooking Instant Pot Cheesy Scalloped Potatoes in my pressure cooker is a game changer! Plus, if you don’t want to heat up your kitchen, use your IP! Winning! Pour the half and half over the layers. So easy! Broil at the end for a crisp crust from the parmesan cheese! Yum! 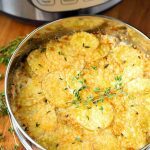 Instant Pot Cheesy Scalloped Potatoes are flavorful with thyme, garlic, and cheese. Put a layer of the sliced potatoes in the bottom of a 7" x 3" oven safe dish (or a size close to that). Sprinkle on a pinch each of the salt, pepper, garlic powder, onion powder, thyme leaves. Repeat step 2 (layering on the spices). Sprinkle on half of the parmesan cheese. Sprinkle on half of the shredded Monterey Jack and sharp cheddar cheeses (not the parmesan). Repeat step 2 with the remaining spices, and all of the 1/4 tsp nutmeg. Gently pour over the half and half (if you can't see the liquid just peeking through the potatoes, add just a little more. You don't want it too wet or covering the top layer, but you want it to be creamy!). Top with remaining Monterey Jack and sharp cheddar cheeses (if you are not intending to broil and crisp up the top after pressure cooking, add the remaining parmesan cheese as well. Otherwise, reserve it for the end). Add 1 1/2 cups of water to the inner liner of the Instant Pot. Cover the dish with foil, or lid, and set dish on a trivet with handles, and lower it into the pot. Choose the Manual (or Pressure Cook) setting on the pressure cooker and use the + or - button to choose 38 minutes (45 for thicker slices). Make sure High Pressure is also selected, if you have the option. Put the lid on the Instant Pot and close it, setting the steam release knob to the Sealing position. When cooking cycle ends, do a Quick Release of the steam and open the lid after the pin drops. Very carefully peel off the foil or remove lid from pan. The steam will be super hot, so be careful! Test for doneness, using a fork. The fork should slide into the potatoes easily. If not, cover them back up and set for a few more minutes. When done, use silicone mitts, or pot holders to grasp the handles of the trivet and carefully lift it out of the pot and onto a countertop or other stable surface. Turn on broiler to 375 degrees (F). and place the oven rack about 6 inches from element. Place dish of scalloped potatoes on a baking sheet. Sprinkle the remaining parmesan cheese over the top of the potatoes. Add a little more if you like it crisper. When broiler is hot, place baking sheet with dish under the broiler for about 5 minutes, or until desired browning is reached. Just watch it to be sure it doesn't get too browned. *If you don't want the cheese, just leave it out and add 2 Tbsp more of the half and half). Wonder if a 1/2 recipe would do in a Mini IP? Hi Pam. I think it will be fine. You may want to start with a little less time. Maybe try 30 minutes. I’m getting my Mini on Tuesday, and I will be testing a lot so I can better answer these questions! Your cheesy scalloped potatoes was outstanding! Delicious and will be in my regular rotation for sure! Hi Susan! That’s great! Thank you for the feedback! I’m so glad you liked them! Comfort food! would it work to just put the ingredients directly into the IP vs into an oven-safe dish and then putting the dish inside the IP? I guess I don’t understand the purpose of using an oven-safe dish inside of the instant pot. Thank you! Looks marvelous and can’t wait to try! Hi Michelle, if you have enough thin liquid to bring the pressure cooker to pressure, then yes, use the inner pot as the potatoes will cook faster. I tend to like my scalloped potatoes thicker, and they kept burning. So I do them this way now and I can have them thick without burning. The tradeoff is the time. This looks great, thank you! I don’t have jack on hand. Can I use 1 1/3 cups sharp cheddar and 1/2 cup parm or will that not be creamy and melty enough? I think it will still be good! If I used my stackables pots like you have pictured on the website would I need to adjust the cooking time for both pots? Need yo feed 14 people for Easter. I haven’t done these stacked, but I would give yourself extra time in case they need to cook longer. The potatoes on the bottom will be closer to the heat source and may get cooked sooner than the ones on top. I would make these as the recipe is written. Then if you need to add time to one or both of the pans, you have that time cushion. If you aren’t going to post a recipe for scalloped potatoes, don’t title your recipe scalloped potatoes. I literally can’t find one that’s not really an gratin. Why would you do that if you know better? At least post a variation without cheese. Varda, I did post a variation. Read the notes section of the recipe card. 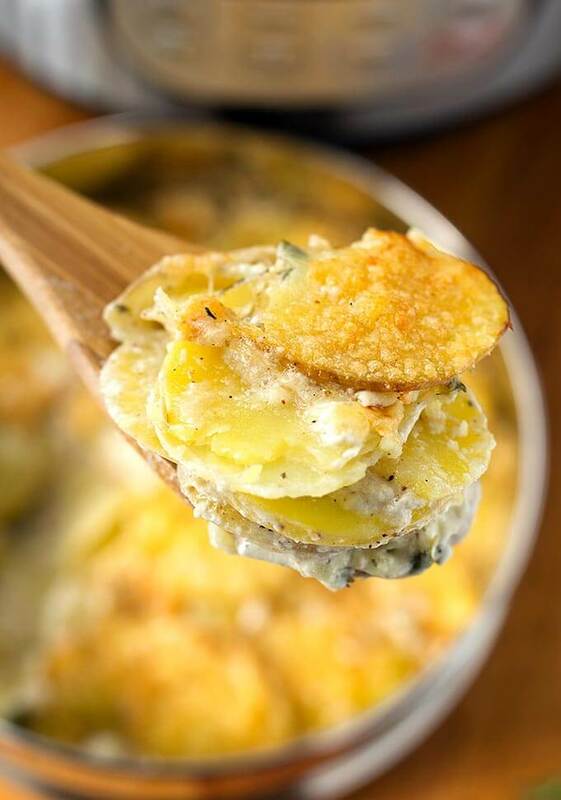 If you simply omit the cheese you’ll have straight up scalloped potatoes. Did you find it necessary to cover the pan with foil? Could I cook it without the foil covering? You can cook it without the foil. A little water does get in there.